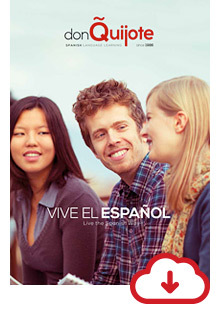 don Quijote provides in-country Spanish language courses in more than 30 destinations throughout Spain and Latin America. don Quijote is an accredited organization with more than 25 years of experience teaching the Spanish language to students and teachers. don Quijote owns and operates its own schools and offers additional locations through exclusive partnerships. We offer a wide range of Spanish immersion programs and activities for all ages including specialized courses for teachers, business and medical professionals and older students. History, art and/or literature classes or fun cultural activities like cooking or dance can also be added to your Spanish curriculum. For teachers interested in bringing a group of students, we offer completely customizable group courses. The possibilities are endless, request your brochure now! We not share or sell information to third parties. You will not be added to an automatic mailing list by providing your information.